Earlier in the summer I met on the ferry an experienced birdwatcher who was about to visit Arran for the first time. With his copy of the Arran Bird Atlas 2007-2012 as well as the Arran Bird Report 2014, he was well prepared for his visit. He was greatly impressed by these publications and expressed the view that the island must be well watched. My view was that the island was not well watched and indeed was under-reported and under-recorded. He expressed surprise. 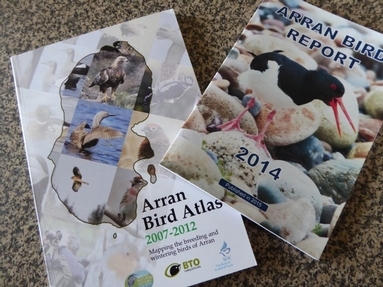 This prompted me to look in more detail at the Arran bird records. In recent years all the Arran data that I have received has been loaded onto Bird Track. This is an excellent system for storing and sharing bird records. I used Bird Track to interrogate the 2014 data. Looking at the number of records for each of the 160 birds reported in 2014, 96 of them had fewer than 50 records and only 5 had more than 200 records, namely Oystercatcher, Swallow, Robin, Chaffinch and Blackbird. Some species are better recorded than others. In addition some birds that would be considered to be common can be over-looked and consequently under-recorded like Carrion Crow with only 54 records in 2014. In addition some areas are better watched than others. Of the 160 birds reported in 2014, 84 were reported from more than 20 sites. Of these, 34 were reported from more than 50 sites and one was reported from more than 100 sites, Chaffinch. Site can be an imprecise word so I looked at the data and related it to measured areas on ordinance survey maps. Arran can be divided into squares of 10kilometre and further subdivided into squares of 1kilometre. Looking at the Arran one kilometre squares (there are over four hundred of these) 45% of them had no bird records at all and a further 30% had less than 10 records. So one quarter of the squares on Arran is accounting for the vast majority of the Arran records, with 7% of these squares each having more than 100 records. Why is this? I think there are a number of reasons. Some areas do have more birds. Areas like Machrie that have a range of habitats have a wider variety of birds than areas with a more uniform habitat like Glen Iorsa. It is not only about areas having different habitats. There is the human factor as well. It is not just that some areas closer to settlements are watched by more people than remoter areas. It is more than that. It is to do with the influence of a very small number of keen birdwatchers. Where they are watching and regularly recording, that's where most of the species are recorded. Other areas that have equally good habitats but are not being watched as regularly are being under-recorded. I have been delighted by the support that I have had from people with an interest in birds who increasingly share their sightings with me. Birding on Arran is interesting at any time of the year but if there is to be an improvement on the coverage of the island, we need more people not just enjoying the birds around their garden but getting out there and enjoying all of Arran with its special places and special birds. If you decide to get out there and enjoy Arran's birds please share your sightings with me by email, letter, a scrap of paper..... you can even put them on Bird Track using your smart phone and I can get them. By sharing, you are contributing to the information on changing bird distribution, increasing our knowledge on the arrival and departure of migrating birds and helping to improve our understanding of environmental change....as well as having fun. As for the experienced visiting birdwatcher, he got back to me after his first Arran visit. Over the long weekend he had recorded over eighty species. He shared “what, when and where” with me. He had had a number of memorable moments, thoroughly enjoyed his time on Arran, vowed he would be back....and he had only met one other person bird watching.